Is Your Tea Bag Toxic? The benefits of drinking tea are innumerable and very well researched. However, studies reveal that some of the newer and “fancy” plastic tea bags could be leaching chemicals during infusion and that our familiar paper bags are not such a good choice either. The Center for Health and Environment and Justice and the Centers for Disease Control and Prevention are seemingly uninformed of this possible health hazard. They appear, as usual, to be turning a blind eye to this potential toxic exposure. Tea bags made from food grade plastic have a fairly high melting point which consumers take as assurance that they are safe. However, this melting point is not the only point to be concerned with. According to Dr. Ray Fernando, a professor of polymers and coatings, we need to be aware of something known as the ‘glass transition’ (Tg) temperature. This is the point at which certain materials, including polymers begin to break apart. As the plastic, made from thermoplastic, viscose rayon. PVC or polypropylene goes through the glass transition state, when it comes in contact with the hot water, the chemicals that they are made of could be released. It has been clearly documented that plastic containers and bottles contain chemicals which leach into whatever they contain posing serious health hazards. Well known compounds include BPA, BPS, phthalates which cause a harmful disruption of hormones in the body. What About Paper Tea Bags? If this were not disturbing enough, the plastic in many tea bags is treated with a compound (epicholordyrin) that is used to produce epoxy resins. This is just not something you want to drink. The National Institute for Occupational Safety states that epicholorodyrin is found in pesticides, coffee filters and the casing of sausage. The main problem with this toxin is what happens when it comes in contact with water. Its composition is altered, and creates a new form called 3-MCPD, which has been found to cause infertility, decreased immune function and cancer in animals. Other studies have identified this dangerous contaminant with modern food production. The American Oil Chemicals Society states that 3-MCPD is commonly found in refined vegetable oils. When heated, these oils release their carcinogenic compounds. Yet, another reason to stick to natural oils such as organic coconut oil. When you purchase your tea make sure that it has not been treated with epicholorodyrin. Taking this extra step to protect your family from possible contaminants is well worth it. Avoid tea bags that are “mesh like” or fancy shapes. These are likely to contain dangerous chemicals. Loose tea is the best choice of all. While it may take a little longer to steep, it is worth the wait. Loose tea often contains more antioxidant power than bagged teas as well, which is just an added bonus. Matcha green tea powder is an alternative and can be added directly to hot or cold water. Matcha is by far, one of the healthiest teas available. 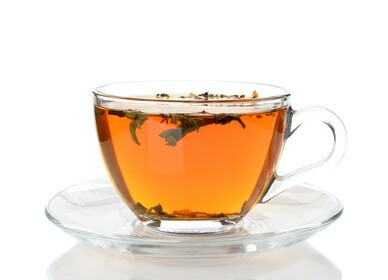 Tulsi tea leaves are an Ayurvedic herb that is full of free radical antioxidants that help fight oxidation in the body. This tea comes in a variety of flavors, each with its own health benefits. Always buy organic tea or you risk that it has been sprayed with pesticides. Don’t give up on your tea, just practice, as always ‘caveat emptor’ when making choices for you and your family. As with any food, the less man has tampered with it, the better it is for your health. Hey Buddy!, I found this information for you: "Is Your Tea Bag Toxic?". Here is the website link: https://www.thealternativedaily.com/is-your-tea-bag-toxic/. Thank you.